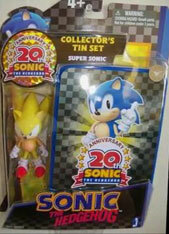 For Sonic's 20th Anniversary in 2011, Jazwares released two lines of figures, (as well as more items) in both classic & modern styles. 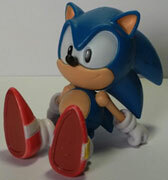 This page has CLASSIC style Sonic figures only, at the 3.75 inch size. Having 2 lines with different looks also fits in with the Sonic Generations Game's theme, which does the same thing. Interested in Anniversary stuff? You can see their Plushes & Modern Style Line. The accessories feel really solid, not cheap or flimsey. MotoBug's tire feels like 'toy car wheel' material, and has treads. Grabber Spiders' legs are sculpted to be quite mechanical looking. Grabber won't grab, and you can't roll Motobug. Which is a bit too bad. Both of these are decent figures. Since they're classic and small, neither has knees or elbows. Tails tails can turn, which helps him to stand up. 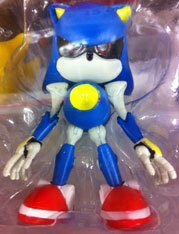 Both figures' heads are solid/heavy, so Sonic may have trouble standing. Neither comes with a base or hole-in-foot. Oddly, they are NOT scaled, so Tails is taller than Sonic. It looks odd if you set them next to each other. 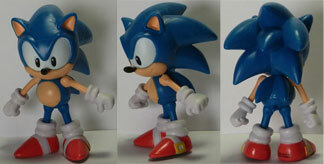 Most of the Tails' waist joints will be easy to turn, most of the Sonics' will be frozen/stuck when you buy. If you attempt to turn him, the legs can break off instead. 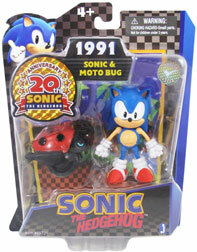 Also notice: That's NOT Sonic 1 Motobug. 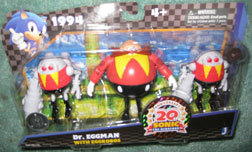 Why did they choose it to represent Sonic 1? That's the one more like from Sonic Colors. Over All: Good figures so far. If you love the classics, pick these guys up! They should be about $6.99 at Target and Toys R Us, 9.99 at GameStop. There's no re-buying of anything here, so the TRU prices are just fine. The screen-cap box backgrounds make them nice for MIB display, and its wonderful to finally have badnicks to play with! They're little things, but it's that pile of little stuff that turns "good" into "great & memorable"
Each classic 3.75 inch figure box has the same back. It has the Generations CG art for classic Sonic, the classic logo, & the same bio for him as everything else. The cards also have screen capture scenes (complete with pixels!) from the game that the badnik & included character are supposed to be from. Sonic's box has Sonic 1 Green Hill, though the Motobug doesn't match that game. Tails' box has Sonic 2 Chemical Plant. 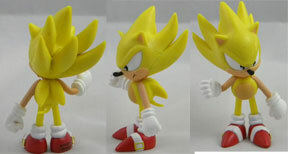 The figure itself looks great, just like their 5 inch size classic Super Sonic, his sculpt is very good, and the expression is nice/appropriate. 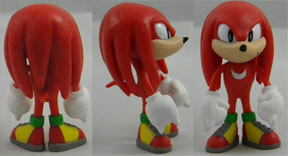 He has the same articulation as regular 3.75 classic Sonic (meaning, no knee or elbows) He also will have a bit of trouble standing up as his head is solid as well. You can fit him in the tin (seen at left) likely along with a few other items if you had the need to store him. 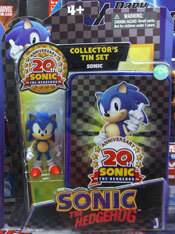 Tins like this are great for keeping accessories from getting lost, or for storing your Sonic cards collection. Loose photos by Taaron. What is this mystery multi pack? Because both JW & F4F are good sculptors, the figures are as expected, quite nice and classic. Again, they did not bother to scale Amy, though they did scale Tails. 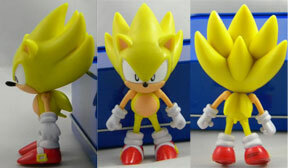 Metal & Super Sonic are the only ones really 'in a pose' but everyone looks pretty decent. They even detailed in Amy's shoe laces & hair tie bottom. These figures are just solid plastic, you can't pose them. They all stand well, & display nicely in the box (which has a clear top) or loose. All minifig photos by Taaron. 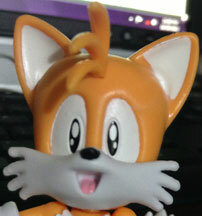 The weakest figure here is Tails, his pose is boring, and the face is 'off'. He's not quite cute. Sonic & Knuckles also suffer from dull poses (like Sonic tried hands on hips but failed with noodle-arms instead) They also have "center of pupil eye shine spot" which doesn't look good and never has. It needs to be off-set like it is in ALL the art there ever is for these guys. Obviously, JW wasn't going to re-sculpt or re-size Amy, even though that was the biggest beef out of F4F. CERTAINLY this will be the least expensive way to grab this set, so DO go and buy it if you want it in any way at all. F4F stuff is good, but you can skip shipping (F4F only sells online) when you just run out and buy this. 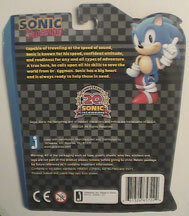 Here's 3.75 size regular Sonic (box seen above) He does not have knee or elbow joints, but he does have a waist-swivel. His head is solid plastic, so he's a tad easy to tip over, but can still have a couple poses. Both hands are just fists. His face & expression are good, & as usual, the sculpt is nice too. 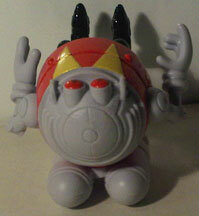 As mentioned above, the Egg Robo is meant to stand ONLY when holding his gun. However, his hand doesn't hold it at all. The solution is right in the box for you. Simply take the clear rubberband that held the fighter in the plastic, and wrap it over the hand & gun handle as shown at left. It is nearly invisible, won't stain like some glue-tacks, and will last about 1 year before the plastic breaks down. 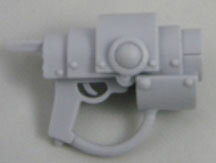 Alternately, the gun can be looped over one hand. All photos & info in this section provided by SonicToast As expected for a big size 10 inch figure, he has great facial sculpt, and good solid joints. He DOES have knees, as the close-up above shows. articulation, & a hollow head so that he is not top heavy and can be posed easily. 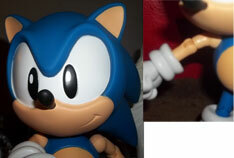 Classic lovers should grab this figure right away, it's a fantastic representation, as proven by the 'big Sonics' comparison photo to the left...which one looks the most 'Sonic like' to you? already own most of these figures (Sonic more than once, if you wanted the collector's tins) because of the cool idea of the badnik+figure combo (ex. 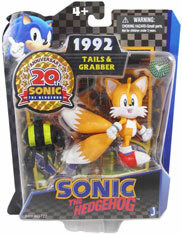 Tails+Grabber spider) or the comic book 2 packs (ex. Sonic+Amy) Another hinderance could be that this set seems likely to only appear at "Toys R Us Outlets" which are temporary, holiday-season-only stores that appear in vacant areas in malls or stripmalls. A similar set with the modern 3.5 figures appeared in 2011's holiday season, and only at TRUOutlets...it seems Jazwares is doing the same thing with this set. 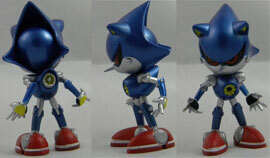 The only new figure of the "Classic Collector's set" above is classic Metal Sonic, seen here with close-ups. His paint is often quite bad (seen at right) with sloppy application-notice that ear yellow all over & messy yellow in the chest. Also, why is his nose BLACK? It never was. It was always just a silver cone. Why are the fingers blunt & jointed? They were never that way in the games either. So he's actually their first oddly inacurate figure. With the comparison shot above, you can see that Classic Metal is much taller than Classic Sonic, though he wasn't that much taller in the games either...so this figure isn't to scale? If not, why? Everything else was. With matte paint, odd inacuracies, forced re-buy, & loads with poor paint application...this isn't a fantastic figure. There are so many strikes against it, it's such a shame, because Metal Sonic is supposed to be quite cool. But 35+ dollars for this guy? Only if you've got cash to spare...unfortunately. Hopefully they'll realize the error of their ways and single-card re-release/improve him. Photos by TiggerCustoms. 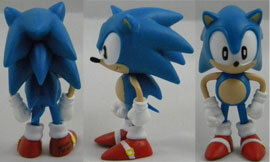 Here is Jazwares classic style Amy figure. She's the 3.5 line, but smaller, since all the classic characters are sculpted as shorter than their modern versions. She looks quite nice here, with good detail to her old clothing. You can see the shoe laces, shirt collar & puffy sleeves. Her expression is nice & cute. As is usual with the classic styles, she has no knee or elbow joints. The hip/leg joint is restricted by her underwear (see white bit in photo below) & some figures may suffer from the paint making some joints sticky. In 2013, the Classic style Amy had only been released as a comic-2-pack with classic Sonic. Here, you can see them together, & she is shorter, as she should be. The far left shows the JW Amy with the display figure/ F4F Amy. As usual, watch out for paint flaws on the individual figure.